In the ongoing first test of the India-West Indies test series, 3 Indians made their test debuts: Abhinav Mukund, Virat Kohli and Praveen Kumar. At the end of Day 2, two of them have had a chance to bat twice and the third, bowled a very good spell of swing bowling and even got barred from bowling for running on to the danger area more often than Daryl Harper could count. 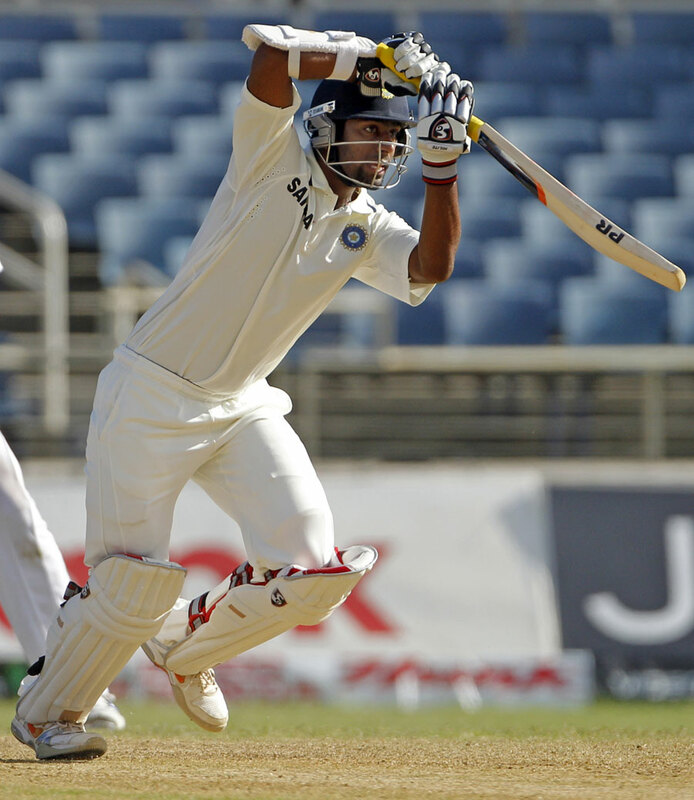 Abhinav Mukund, coming on the back of a very good domestic season, slotted to open – had it the toughest of them all. Coming fresh in to the test series, without really having a chance to get acclimatized to the local conditions, he had to justify that the selectors made the right call in sending him to the West Indies, ahead of others. Mukund’s first dig consisted of many nervy shots – expected of a debutant. With the new ball swinging and pretty good bounce on offer, the inside edge on to the stumps looked inevitable. But he gave a glimpse of what he is capable of, even at the highest level of the game in the 2nd innings. The most impressive part, besides the neat little punch down the ground, was his leaving of the balls outside his off stump – a lesson he seems to have learned from the 1st innings. Having watched M Vijay get out to a duffer must have put some serious doubts in his mind as to the variable bounce on offer, yet, he got behind the ball whenever he had to and showed a bit of his timing while whipping off his hip on the backfoot. The drinks break perhaps broke his concentration and he got out caught behind trying to cut a faster one from Bishoo. Spending nearly 24 overs on the field with a man known for his focus and concentration – Rahul Dravid, surely would’ve been one of the best experiences he has had in his career as a cricketer so far. 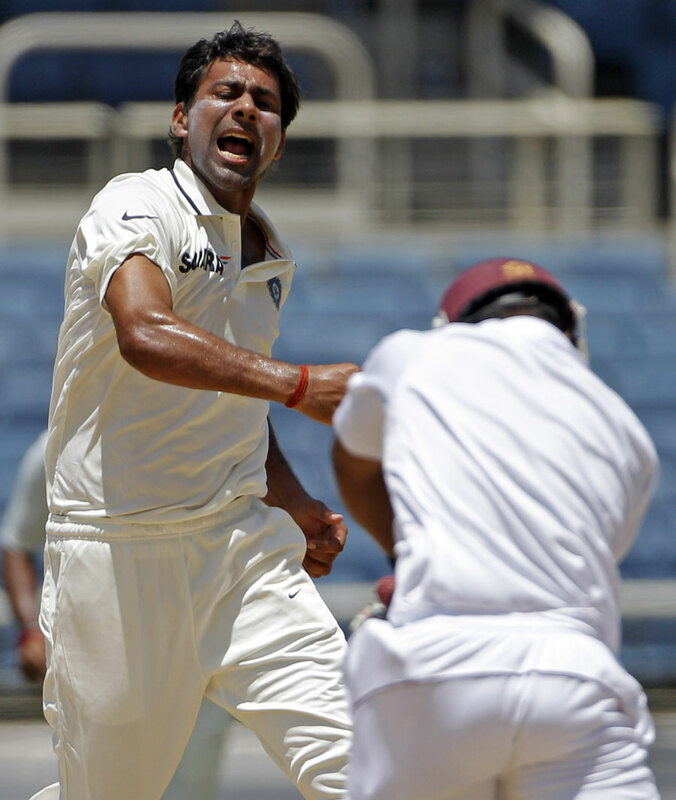 Praveen Kumar would not have made his debut if not for the late withdrawal of Munaf Patel. Every one knows Kumar does not have the pace to trouble batsmen but has shown tremendous control and nous in swinging the ball both ways in LOIs. It was going to be interesting to watch him handle the old ball and whether the openers will look to target him. Kumar had figures of 8-2-12-0 at the end of day 1. Not to shabby a start, but there was more to come. On 2nd morning, brought in to replace an impressive Ishant Sharma spell, Kumar displayed the traits that were expected of him. Swung the ball, had very good control of his line and bowled a nagging length, a must for someone not blessed with the natural gift of pace. And he got his first wicket in test cricket with an absolute peach. A back of length delivery, swinging in towards middle that swung away after pitching from the right hander Barath, took the edge and nestled in Dhoni’s mitts. A jaffa of a delivery. He took his 2nd wicket in the very next over. Having sussed Darren Bravo with deliveries that swung in, he bowled one that basically held its line, took the outside edge. When he took his 3rd wicket (B Nash), his figures read: 13.1-5-22-3. As impressive as test debuts go. In the meantime, he had been warned for running on to the danger area and eventually barred from bowling in the innings at the end of over 51, with personal figures of 18-5-38-3. Hope is that he makes the adjustment to his followthrough to avoid getting barred again but the trick is to make sure it doesn’t mess with his release. On to the batsman who has already made a name for himself in international cricket and is expected by many to be one day, the captain of India and own the No.4 slot in the batting order whenever Tendulkar retires. Virat Kohli got sawed off in the 1st go by Fidel Edwards playing at an outswinger he didn’t have to. It was made to look worse as it came in the last over before lunch. He had to play for the break but the debut jitters (or his aggressive nature) got the better of him, perhaps. Kohli’s 2nd knock of the test featured the most fun 2 over spell (from Fidel Edwards) of the match, yet. In the 39th over, Fidel bowled 2 bouncers, one that hit Kohli on the arm as he took his eyes off the ball. It is well known that Kohli is quite the cocky character. After the 2nd bouncer from Fidel that was followed by a stare down, Kohli blew a kiss to the bowler. The 41st over (and last of the day) continued on from where 39th left off and should’ve been the end of Kohli. More short balls. More discomfort. More blown kisses. One possible catch not going to hand. Welcome to Test Cricket Kohli. Now that you have got through the tough phase, dig in tomorrow and make this one count. Once the regulars come back to the side, quite possibly none of this three would feature in the XI during the England tour and further on, at least in the short term. So far, Praveen Kumar has made the best impression of the three and Kohli still has a chance to join him tomorrow. But overall, not a bad start for them all and they have two more tests to make their future claims,louder and more importantly, heard. This entry was posted in Test Match Cricket and tagged Abhinav Mukund, India, India Tour of West Indies 2011, Praveen Kumar, Test Cricket, Virat Kohli. Bookmark the permalink.